Fire and Rescue personnel attending to the injured woman at Jalan Gana, Kampung Piso in Pitas. 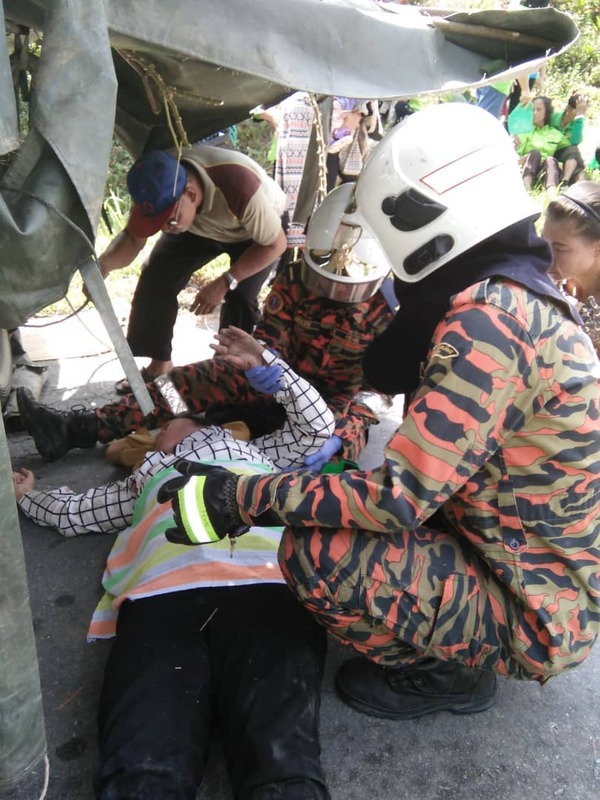 KOTA MARUDU: A woman sustained serious injuries while 16 other women suffered minor injuries after the Toyota Hilux they were on board was involved in a road accident along Jalan Gana, Kampung Piso in Pitas. Kota Marudu Fire and Rescue station chief Rony Sikawan said, among those injured in the 9am incident were two children. “We received a distress call at 9.17am and immediately deployed seven Fire and Rescue personnel to the location. “A 43-year-old woman, the passenger of the four-wheel-drive vehicle, were rushed to hospital after sustaining severe injurues, while 16 others, including the woman driver, only sustained minor injuries,” he said. Rony added that two children, age six and three, were among 17 people on board the vehicle when it skidded off the road. The victims were taken to hospital in ambulances and public vehicles while the operation ended around 10.20am, said Rony.